Dow Theory is like a light switch. Once it is turned on, it stays on until it is turned off. Likewise, a BUY signal stays in force until such time that a SELL signal is given thus reversing the previous BUY signal. It is binary. It is 1 or 0 — there is no gray area — except in interpretation. The most difficult time a Dow Theorist has is during a secondary reaction (rally in a bear market or reaction in a bull market) when the change in primary trend is not yet clear. Since the confirmed dual January highs in the Transportation Average and the Industrial Average, we have seen a pullback or reaction of less than 10%. During the previous bull market from 20003-2008 we experienced several pullbacks of less than 10%. Until such time as we get a SELL signal, I have no choice but to take the most recent pullback as just that: a secondary reaction in a primary BULL market. 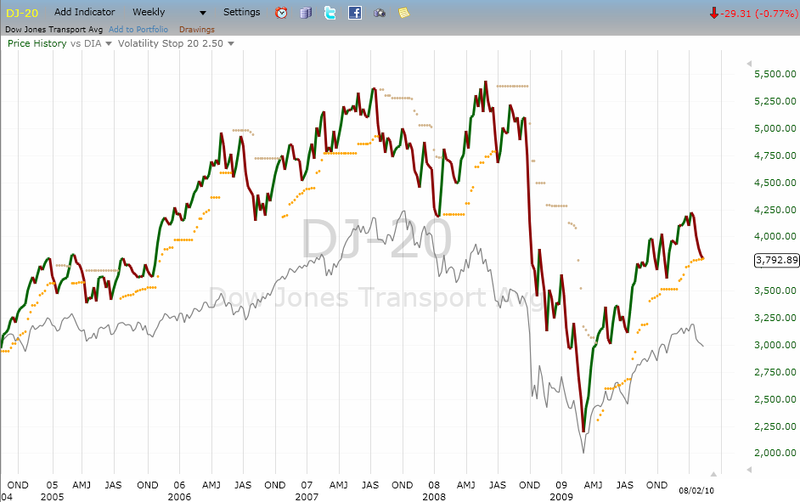 Let’s take a look at the Transportation average below (I have included the Industrial ETF called DIA in grey). When you look at the weekly chart above, the correction looks like a normal reaction in a long-term uptrend. If you have not established your bullish positions yet, I recommend you use this “sale” to do so. Check our AlphaDow or ETF Advisor page for recommendations.